Saita Publications | Free ebooks: A scheduled Saita flight bound for Zygos Kavalas! A scheduled Saita flight bound for Zygos Kavalas! After an invitation from the Associations of the village (Naturalist, Pontiac and Parents & Guardians), Saita will be participating in the Christmas events which will take place Saturday the 14th of December in the center square from 14.30 to 19.00. Storytelling and craft making out of recycled materials, ornaments for the Christmas tree in the square, and the first drawing competition for all the students are a few of the activities that will happen on the colorful Saita wings for that day but also for the previous period in collaboration with the Elementary School of the village. 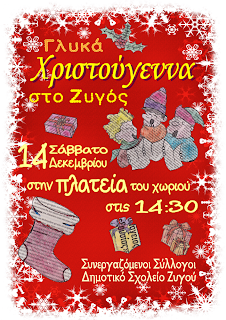 Already the Saita team has designed the event’s poster with the drawings of Mary Lampadariou, from the fairytale “The state that did not have Christmas” by Evridiki Amanatidou.